Visible Ink Press : Which superhero is vulnerable to the color yellow? Which superhero is vulnerable to the color yellow? There are actually many heroes with his name all across the galaxy, as well as several on earth who have taken his name. His power is that almost anything he can imagine can become real. In his first incarnation, he gets his powers by discovering a talking green lamp. He partnered with the Green Arrow in a series of adventures in the 1970s. 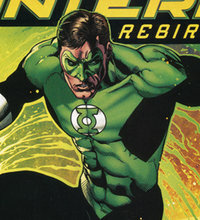 From humble beginnings, the Green Lantern concept has evolved through numerous revamps (with five Lanterns as of 2004), a complex mythology, and countless spin-offs. The character was first launched in July 1940 by artist Mart Nodell, with additional input from Batman writer Bill Finger, in the pages of All-American Comics #16 and immediately became one of DC Comics' biggest and most powerful stars. Like many early superheroes, his origin was based in magic; while working on a bridge, construction worker Alan Scott comes across a green lantern, which he later discovers was made out of a meteor. Somewhat improbably, the lantern speaks to Scott, instructing him to make a ring out of its extraterrestrial material. The ring would transform thought into reality as long as he touched the lantern once every twenty-four hours. Indeed, the power ring enables Scott to fly and take on any kind of superpower. In short order, Scott fashions himself a garish red-and-green costume (duly acknowledging, "I must have a costume that is so bizarre that once I am seen I will never be forgotten") and then, of course, embarks on a career of crime fighting. Initial stories concentrated on the Lantern's dispatching ordinary hoods, often in a surprisingly ruthless manner, but as his powers became increasingly mind-boggling (from flying to mind-reading and, eventually, imperviousness to bullets), his villains also needed to be more far-fetched. Colorful criminals such as the Sportsmaster and the Harlequin (a female villain who was also in love with Green Lantern) began to predominate, but by far the most remarkable protagonist was Solomon Grundy--a giant reanimated corpse--created by noted science fiction author and regular Green Lantern writer Alfred Bester. By this point, DC had limited the hero's abilities somewhat by making his ring powerless against wood, but he was still a very potent wish-fulfillment figure for his fans. In addition to appearing in more than eighty issues of All-American, he also starred in his own solo comic for eight years, in Comic Cavalcade, and in many issues of All Star Comics as one of the principal members of the Justice Society until that comic's cancellation in 1951. Alan Scott continued to appear throughout the 1960s as part of the Justice Society and has been a constant member of the group in its many revivals, rebirths, and relaunches ever since. Following the successful revamp of the Flash in 1956, editor Julius Schwartz (along with John Broome on scripts and Gil Kane on art) turned his sights on Green Lantern. The new Green Lantern premiered in September 1959 in DC's Showcase #22, with a new history: Test pilot Hal Jordan chances upon the crashed space ship of an emerald-garbed, red-skinned alien named Abin Sur. With his dying breath, the alien passes on his green ring to Jordan, whereupon he becomes transformed into an identically clothed superhero. Like his predecessor, this Green Lantern could use the ring to make his thoughts reality and he, too, needed a lantern to recharge the ring, but its weakness this time was to anything colored yellow (which inevitably was the cue for countless stories about yellow aliens, villains, and monsters). When the Lantern (nicknamed the Emerald Crusader) recharged his ring every day, he recited an oath that soon became his mantra: "In brightest day, in blackest night, no evil shall escape my sight. Let those who worship evil's might, beware my power--Green Lantern's light!" It was the ring's background that differentiated the two strips; it seems that the later Green Lantern was but one of many ring-wielding superheroes across the universe--members of a sort of intergalactic police force. The Green Lanterns were picked by small, blue-skinned aliens, known as the "Guardians of Oa," as the bravest individuals on their own planets, and with their almost omnipotent rings they were sworn to uphold justice and defeat evil wherever it may appear. The Lantern stories were dynamic and inventive, often revolving around some alien menace or scientific conundrum, but characterization was not a strong feature. Hal Jordan was based on Gil Kane's neighbor at the time (an up-and-coming actor by the name of Paul Newman), and despite an attractive supporting cast, including girlfriend Carol Ferris and best buddy "Thomas "Pieface" Kalmaku," he was something of a loner. The principal villains were the rogue Green Lantern, Sinestro, and the powerful Star Sapphire--in reality Jordan's schizophrenic girlfriend Ferris. Other major Silver Age Green Lantern villains included Black Hand, Evil Star, Hector Hammond, the Shark, Sonar, and the Tattooed Man. Green Lantern started appearing in his own self-titled comic in 1960, soon became a regular member of the Justice League of America, and was very much one of DC's top characters throughout the 1960s. Kane developed into one of comics' most exciting artists, but when he left the title to try becoming a publisher himself, Green Lantern's popularity dropped. Eventually the decision was made to boost sales by introducing the Green Arrow in a retitled Green Lantern/Green Arrow comic, featuring the creative team of writer Denny O'Neil and artist Neal Adams. Over the course of fourteen issues (#76-#89), the comic became one of the most talked-about titles of the 1970s, tapping into the radical politics of the era and the growth of the counterculture. The Green Lantern was portrayed as the arch-establishment figure, whose complacency was constantly challenged by the anti-establishment firebrand, the Green Arrow. As the voice of the streets, O'Neil and Adams introduced the concept of "relevance" to comics, tackling a different social topic in each issue, including race relations, Native American rights, women's liberation, pollution, consumerism, drugs, and campus unrest--subject matter previously untapped in the comic book world. Surprisingly, despite enormous media interest, numerous industry awards, college tours, and Adams' outstanding draftsmanship, sales were never strong (though conspiracy theorists have suggested that issues were appropriated by organized crime and sold to fans later) and the comic was canceled in 1972. Backup strips in The Flash eventually led to the Green Lantern series' revival in 1976, and it continued in various guises until 1988. Green Arrow left the comic in 1979 and it was retitled Green Lantern Corps for its last few years, but it was mostly a pale shadow of the pioneering relevance period. The Green Lantern Corps retitling reflected the increasing number of Green Lanterns that had popped up over the years, many of them enjoying success in their own right. The first of the new Green Lanterns at around this time (though originally appearing in 1968) was Guy Gardner, who was Hal Jordan's replacement should anything happen to him. Gardner later took over Jordan's ring and became a rather bad-tempered (and occasionally villainous) superhero, with an appalling, pudding-bowl haircut. The fans loved his bad attitude, and in the 1980s he became a regular in the Justice League, which led to his own comic in 1992; this ran for more than four years. The next replacement Lantern to star in a comic was John Stewart--one of the earliest African American heroes--who first appeared in the O'Neil/Adams period and was portrayed as a proud defender of the black community. From the 1980s to the 2000s, he has periodically taken over the lead role in the Green Lantern comic and has made numerous appearances without ever building up a large fan base (though outside the comics medium he's had a shot at a whole new audience as the Lantern who got the call for Cartoon Network's popular Justice League show). Even alien Green Lanterns have broken out of the background, with the pug-faced Kilowog joining the Justice League, and another short-lived Green Lantern Corps comic running (albeit quarterly) from 1992 to 1994. In 1989, a miniseries called Emerald Dawn was meant to herald a new beginning for the character, but the following years have been almost impossibly complex, so that even the most devoted fan could be forgiven for becoming confused. Hal Jordan developed a drinking problem and then, having seen his home city destroyed, went mad and turned on his overseers, the Guardians of Oa. Not surprisingly, the Guardians resolved to replace him and discovered young artist Kyle Rayner (in Green Lantern vol. 2 #48, 1994), who has been DC's main Green Lantern ever since. Jordan, meanwhile, became a character called Parallax and flounced around the universe, killing people before being killed himself. (It was later revealed that Jordan had been under the mental influence of an evil entity called Parallax.) Jordan was resurrected several years later as the Spectre. Alive and sane once more, Hal Jordan returned to his role of Green Lantern in the comics series Green Lantern: Rebirth (2004-2005), written by Geoff Johns and drawn by Ethan Van Sciver. In September 2011 DC Comics launched four new Green Lantern-related comics series: Green Lantern, starring Hal Jordan, written by Geoff Johns and drawn by Doug Mahnke; Green Lantern Corps #1, featuring Guy Gardner and John Stewart; Green Lantern: The New Guardians #1, starring Kyle Rayner; and Red Lanterns #1, about the Green Lantern Corps' ruthless counterparts, the Red Lantern Corps, led by Atrocitus. In June 2011 Warner Bros. released a live action Green Lantern movie directed by Martin Campbell and starring Ryan Reynolds as Hal Jordan. The cast also includes Blake Lively as Carol Ferris, Mark Strong as Sinestro, Peter Saarsgard as the villain Hector Hammond, Michael Clarke Duncan as the voice of Kilowog, and Clancy Brown as the voice of Parallax. Hal Jordan is Green Lantern in a number of direct-to-video animated films, including Justice League: The New Frontier (2008) (in which Hal is voiced by David Boreanaz, and Carol Ferris is played by Brooke Shields), Green Lantern: First Flight (2009) (with Christopher Meloni as Hal, Victor Garber as Sinestro, Olivia d'Abo as Carol Ferris, and Michael Madsen as Kilowog), and Green Lantern: Emerald Knights (2011), with Nathan Fillion as Hal and Jason Isaacs as Sinestro. A new computer-animated Green Lantern: The Animated Series, produced by Bruce Timm, premiered in 2011 on Cartoon Network. Hal Jordan has even appeared with Daffy Duck in a 2003 episode of the animated TV series Duck Dodgers, with filmmaker Kevin Smith as the voice of Hal and John de Lancie as Sinestro. The coming years will doubtless bring more plot twists and more Green Lanterns, but for many fans, Hal Jordan will remain the one true Lantern.